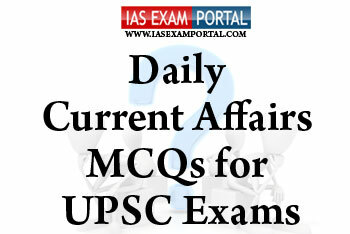 Current Affairs MCQ for UPSC Exams - 11 August 2018 | IAS EXAM PORTAL - India's Largest Community for UPSC Exam Aspirants. Q1. The Prime Minister, ShriNarendraModi, launched PARIVESH (Pro-Active and Responsive facilitation by Interactive, Virtuous and Environmental Single-window Hub) on the occasion of World Biofuel Day. Which of the following regarding PARIVESH scheme are true? 1) It includes a single registration and single sign-in for all types of clearances (i.e. Environment, Forest, Wildlife and CRZ). 2) PARIVESH offers a framework to generate economic growth and strengthens Sustainable Development through EGovernance. 3) It enables project proponents, citizens to view, track and interact with scrutiny officers, generates online clearance letters, online mailers and alerts to state functionaries in case of delays beyond stipulated time for processing of applications. Q3. Which of the following statements regarding cage aquaculture are true ? 1) Cage farms are positioned in a such way to utilize natural currents, which provide the fish with oxygen and other appropriate natural conditions. 2) Cage culture is a low impact farming practice with high returns but high carbon emission activity. 3) Vast brackish water areas available in coastal states and other underutilized water bodies can be better utilized by adopting cage culture. Q4. Which of the following regarding Child Labour (Prohibition & Regulation) Amendment Act, 2016 not true? 1) It provides for complete prohibition of work or employment of children below 14 years in hazardous occupation and processes only. 2) The amendment also provides stricter punishment for employers for violation of the Act and made the offence as cognizable. 3) Government has framed the Child Labour (Prohibition & Regulation) Amendment Rules, 2017 which inter alia specifies the duties and responsibilities of State Governments and District Authorities to ensure effective enforcement of the provisions of the Act. Q5. World Wildlife Crime Report is published by which of the following global institutions ?